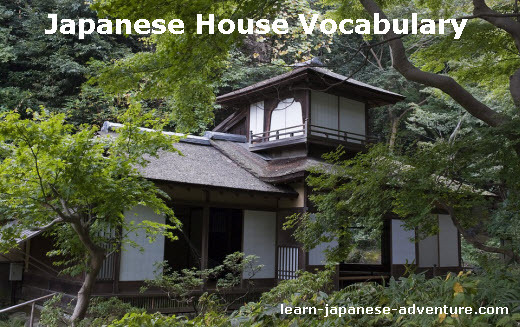 This section covers the words and vocabulary of things related to Japanese House. Have you been invited by your Japanese friends to their houses (in Japan) before? If you have the chance to visit their house, you may find some unique things that you won't see elsewhere. For example some Japanese houses may still have 畳 (tatami), thick Japanese straw mats that cover the floor, in some of the rooms. 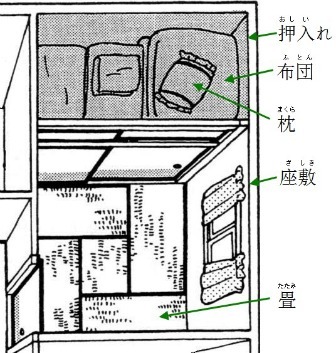 In fact, the way how the Japanese measure the size of their rooms is by using counter of tatami mats, or 畳 (jou). (Note: same kanji but different pronunciation). Rooms that were completely laid with tatami are known as 座敷 (zashiki). Another thing you may find in a Japanese house will be the use of 布団 (futon), a traditional Japanese-style bedding, for sleeping. This padded mattress can be folded and stored in the 押入れ (oshiire) which is a closet, so that the room can be used for other purposes during the day. What other special things have you seen in a typical Japanese house? Let's explore on the word list. The above is the common word list of things you can find in a typical Japanese house. I may have left out some words but I will continue to add to the list when I have collected more words on things related to Japanese house.